The area available for landscaping and open space was minimal at the 17th Avenue Residence Hall. 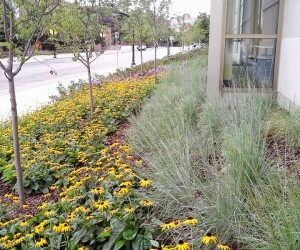 The University of Minnesota’s urban site required a maximized building footprint while still providing landscaping and stormwater management. 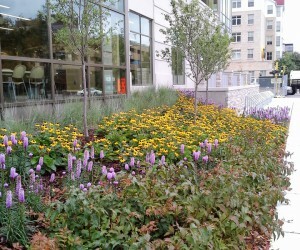 Innovative stormwater management and treatment options were integrated with native plantings to provide a sustainable urban landscape. 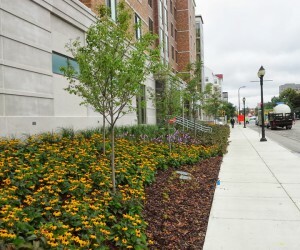 Kestrel utilized the public right-of-way to provide street trees to meet City landscape requirements, complement adjacent landscaping, and work well within the University Campus Master Plan. Stormwater management techniques were incorporated within the at-grade landscape. Through both at-grade landscape and green roof, plant material helped soften this urban site, reduce heat-island effect and provide a sustainable base on which to site an innovative student housing structure. Working collaboratively with building and civil design, the landscape provides credits toward LEED Silver and B3 Sustainable Building Guidelines. The residence Hall incorporates a gray-water recycling system to take water from sinks within the facility, treat it with ozone, and reuse it for irrigation of the landscape. All stormwater is captured on site through the landscaping and porous pavements, collected in a large subsurface cistern and reused. Where in the World is Peter MacDonagh?